Think of the Oshkosh L-ATV (Light Combat Tactical All-Terrain Vehicle) as a real-life Halo Warthog. 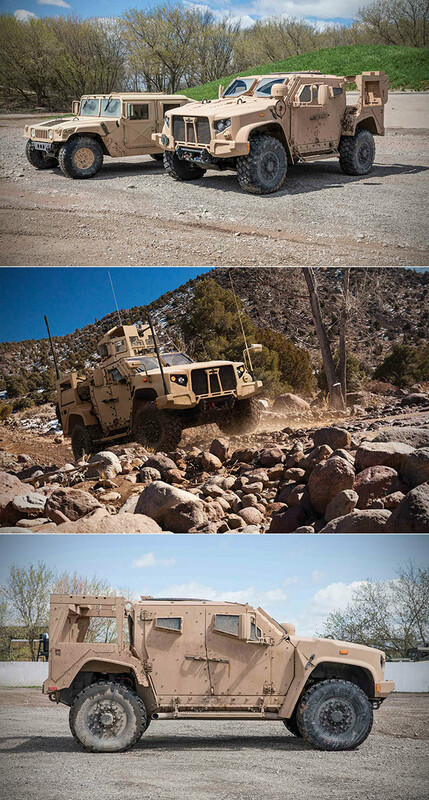 This light utility/combat multi-role vehicle won the US military’s Army-led Joint Light Tactical Vehicle (JLTV) program, and will part-replace the HMMWV. It delivers a level of protection similar to that of current, but far heavier and less maneuverable, Mine Resistant Ambush Protected (MRAP) class designs, these having far more protection from blast than even the latest up-armored HMMWVs. Power comes from a Gale Banks Engineering 866T V-8 diesel producing around 300 hp, mated to an automatic six-speed Allison Transmission. The base L-ATV does not have a standard armament, however it can be fitted with a selection of weapons including light, medium, and heavy machine guns, automatic grenade launchers, or anti-tank guided missiles (ATGMs) depending on user requirements. Click here for the first image in today’s viral picture egallery. Continue reading for a viral video of the most indestructible animal on Earth.